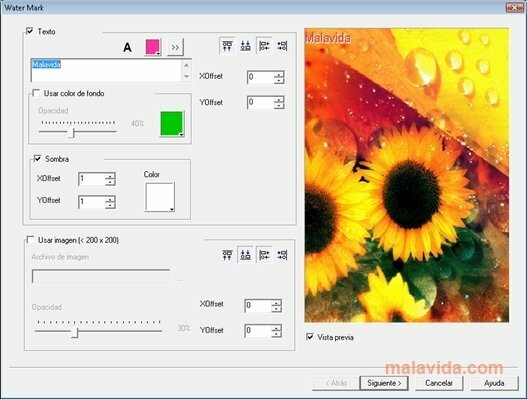 Image Converter One is a simple application that has four basic functions: changing the size of the images, changing the format, creating a watermark, and adjusting the image rotation. On many occasions, we want to perform small changes to our photos and we have to resort to complex image editors. Image Converter One will allow us to perform these changes in a quick and simple manner. In only a few steps, we'll have our images ready with their changes performed. First, we have to choose the files that we want to modify. They can be single files or a full folder. After that we have to indicate which action we want to carry out and specify the data for the configurations: the size, the format, watermark and the rotation. We can also view the images so as to make sure that we don't get mixed up with the file. 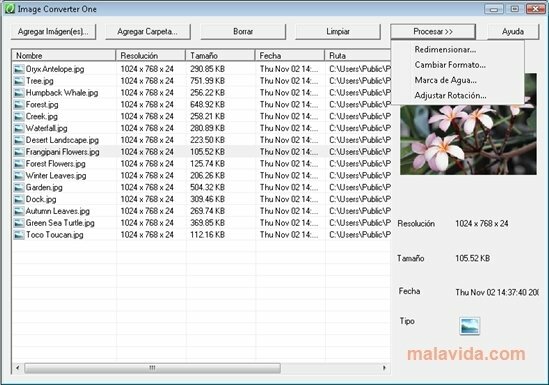 Image Converter One recognizes a wide range of image files: JPG, BMP, TIFF, PNG, GIF, PSD, PCX, RAS, ICO, CUR, and WMF. Image Converter One is the tool that we need to apply small enhancements to our photos. Forget about resorting to complex editing program and try out this simple application.